This auspicious start creates the perfect storm. Taking this input, the agency begins an accelerated product or creative development process to meet a launch date which someone etched in stone. All of this is done with the best of intentions. People who create a product are so close to it. They speak the same language, have a shared understanding about the “killer” differentiator, who the audience is and why it will blow competition out of the water. First, we got the agency, marketing, product, design, research, and UX folks in a room. We asked everyone to define success, review their personas, and evaluate the product prototype –which all of us thought had incredible potential. As we walked through the workshop, people came around to a surprisingly shared perspective about the value of the product and what research needed to address to answer. In a matter of hours, the room was on the same page. Bottom line, people naturally seek alignment. It is communication that is the challenge! Fast forward – the agreed upon research was done. It affirmed the value of each product to different audiences and enabled the team to agree upon a set of personas to use for marketing and messaging. The lesson here is if you want to build consensus and iron out points of departure, get in a room! Have all the key people vested in success align on the what, the why, and the who and then do research to ensure your assumptions are solid. If not, pivot toward success. Everyone wins (and contrary to what research is often accused of) you get to market faster and better. 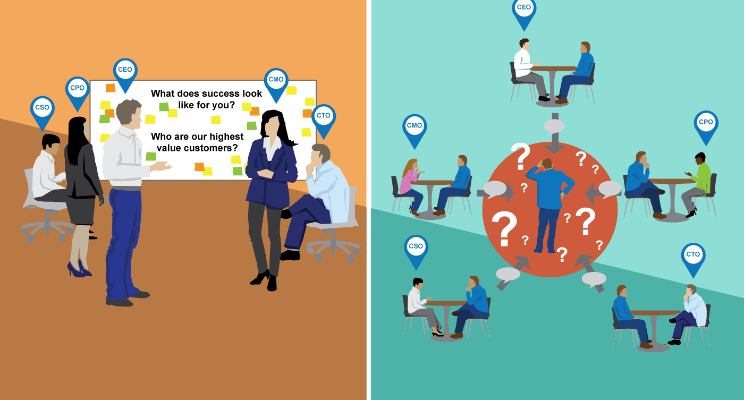 Have you ever engaged in a stakeholder workshop? What did your team discover? Tell me your thoughts below!